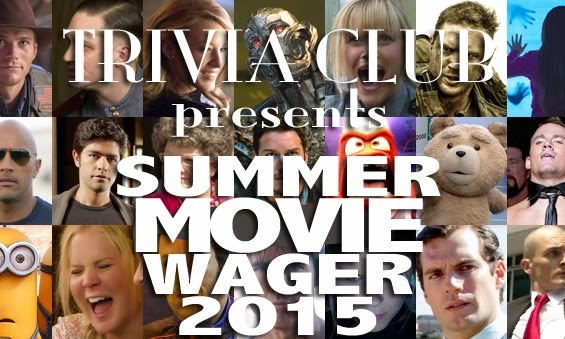 It's time for our THIRD ANNUAL Summer Movie Wager! Sarah C. won our first go around with 49 points in 2013, while Patrick D. is our reigning SMW winner with 56 points! Lookit how happy he is with that trophy! So happy! So proud! As he SHOULD be! The object is to pick the films that you think will be the top-ten grossing films of the summer, in order of box-office performance. That means only films released from the first weekend of May to the Labor Day weekend, counting only the money those films make domestically (US and Canada) in that period. In other words films from March or April might still be making money after May 1st, but they don’t count; films released from May on could start racking up foreign Box Office, but that doesn’t count; films released from May on could still be making money into September, but that doesn’t count either. Box Office numbers are generally available late Monday or Tuesday after the weekend closes. So what you will be doing is figuring out what 10 films will make the most money, and putting them in order of what you think they will gross at the box office. BUT, in addition to your top 10, you get to pick 3 “Dark Horses”- films you think *might* make it, but that you are not confident enough about to put into the top 10 proper. So we gave everyone who wanted to join in, a chance to rank their Summer Movie Top Ten, plus Three unranked Dark Horse picks! Firstshowing.net has an impeccably updated list films coming out between May 1st and August 28th, of 2015 (the films within the Summer Movie Wager eligibility), and we also recommend THR for more information about all of these films. Ultimately, however, it is your responsibility as a participant to make sure all the films you choose will be coming out in 2015! Check in after Labor Day for the results on this years wager! In case you were wondering, yes HERE we are! It's the return of the Top 10 Monthly Scoreboard. April's Scoreboard was understandably set aside from the grander Grand Championship Grand Prix glory. Which featured not just the top scores, but an accumulated listing, as well as ALL OTHER scores for the month of April! This is not that, this is right on back to the Top 10, featuring facts and figures of those teams and locations included. After winning the 2015 Grand Championship, and garnering 3 of the Top 5 scores (1st, 2nd, & 5th) last month, the Electric Bastards did not appear in the Top 10 scores this month. Neither did their equal parts the Electric Mayhem or The Bastards. 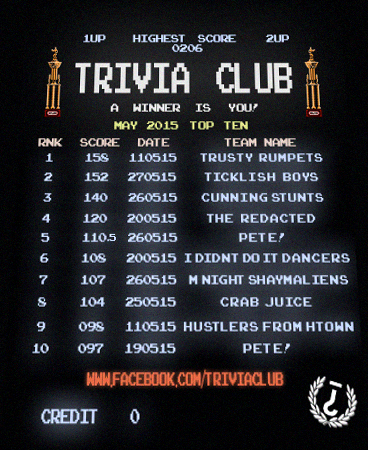 The third highest scorer in April, PETE!, however did appear on May's Top 10 and was in fact the only team (one-man or otherwise) to appear multiple times. By name, that is, as the exact same team members make up both Crab Juice, as well as the Hustlers from Hustletown (and they are also known as Hitch's highest scoring team all-time, Stupid Lisa Garbage Face). The Trusty Rumpets end the month with the highest score for the first time since October of 2014, when they were known as the Rusty Trumpets. They're all the highest score at Hitch in May with 158 points. Not only did The Ticklish Boys (?) garner the highest score at Cardinal Rule in May, with 152 points, but they also did so on their first time out to Trivia while breaking The ||||||| Redacted's chance at the near elusive Golden VHS Threepeat! Aside from garnering the fourth highest score of the month, The ||||||| Redacted were also the highest scoring team OUTSIDE of the Top Ten! Eleventh place in May meant 93 points. The Mean Team of May, with the score closest to the Top Ten average, were also The ||||||| Redacted! 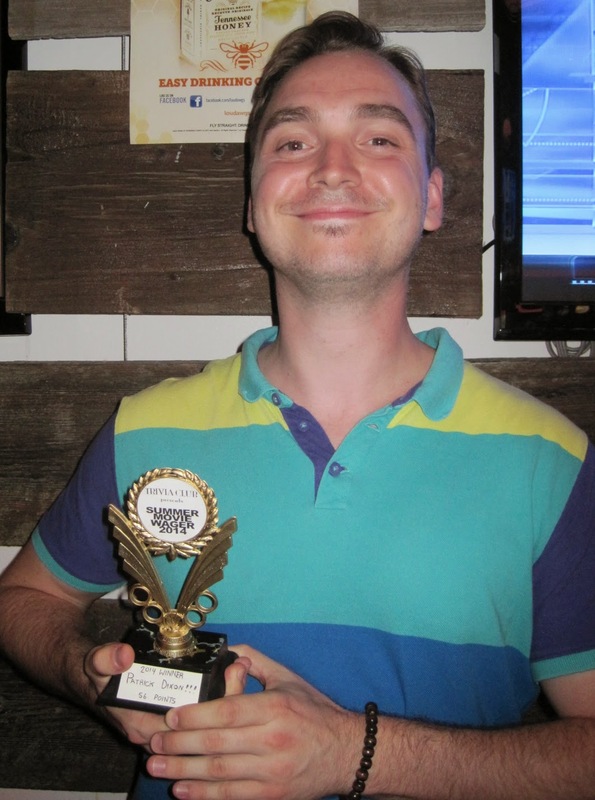 The Cunning Stunts had Lou Dawg's Ryerson's highest score of the month with 140 points, on a night that also nabbed the 5th and 7th highest scores of the month overall. After garnering the seventh highest score of April, the M. Night Shaym-Aliens got the sixth highest score of May, and with seven fewer points then last month! Half of the Top 10 scores of May happened in the last week of shows, on the 25th, 26th, and 27th. Lou Dawg's Ryerson was responsible for FOUR of the high scores in the Monthly Scoreboard for May while Cardinal Rule, and Hitch, were each responsible for THREE high scores.